Ink, collage, screenprint, gouache, Oscar T quotes on paper. Oscar T has a cool leather jacket, 2016. Rough Boundaries, BackRoom Gallery, Peckham 2016. Pillars - collaborative Alex Edwards & Adam Watts. Ink and screen print on paper. Rough Boundaries, Screenprint and ink on paper, collaboration Alex Edwards and Adam Watts, 2015. Derelict Site, 3 colour screenprint, Adam Watts, 2013. 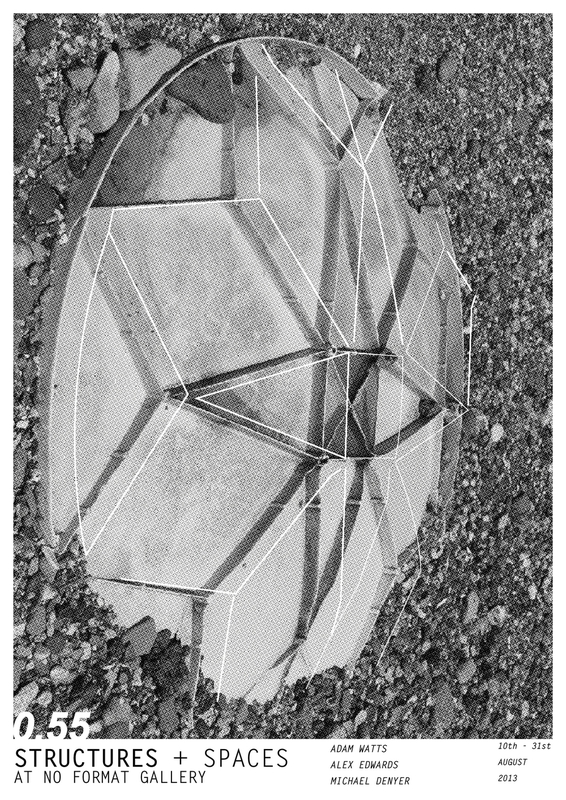 Exhibition Poster 0.55, Screenprint, Structures and Spaces, (Denyer, Edwards & Watts) 2013. 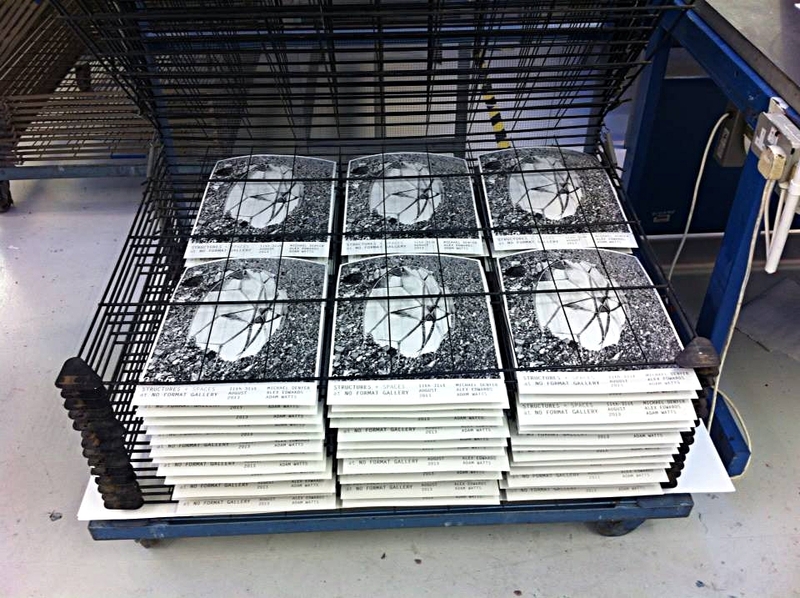 In Collaboration book featuring Structures and Spaces. Released 2014. 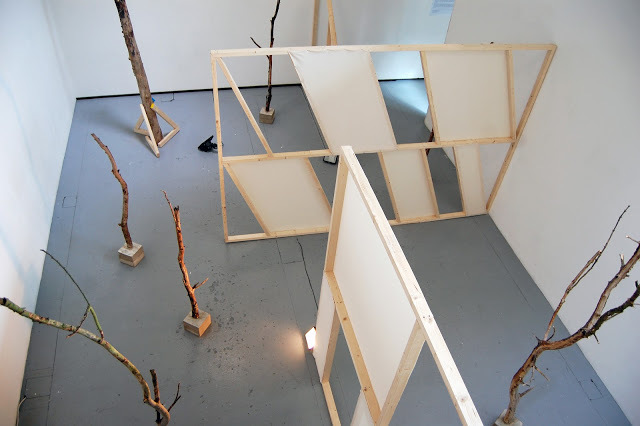 0.55, Structures and Spaces (Denyer, Edwards & Watts) Installation shot at No Format Gallery, London, 2013. Test Shelter, Structures and Spaces (Denyer, Edwards & Watts) shot at Supernormal Festival, Braziers Park, Oxford 2012. 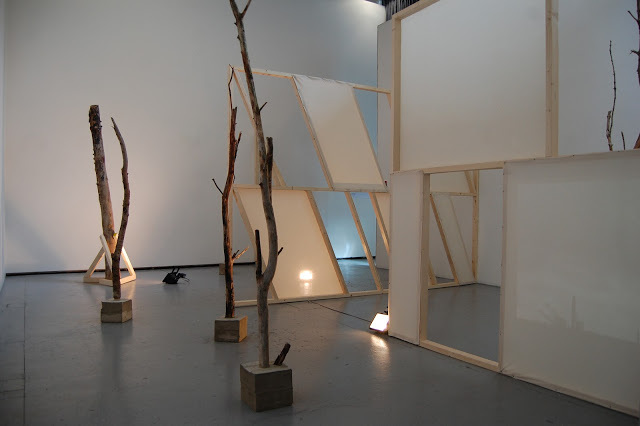 Structures and Spaces (Denyer, Edwards & Watts) installation shot at Norden Farm Arts Centre, Maidenhead 2012. Half Built Sight, JTP10, James Taylor Gallery. Installation Adam Watts, 2011. Collaboration between Isabelle Grech and Adam Watts, shot at Second Floor Studios, 2013. Building A Defence: Engine Room 32 Exhibition Poster, Solo show at SHIFT. Gallery, London, Adam Watts, 2010. Building A Defence: Engine Room 32 Installation shot, Solo show at SHIFT. Gallery, London, Adam Watts, 2010. 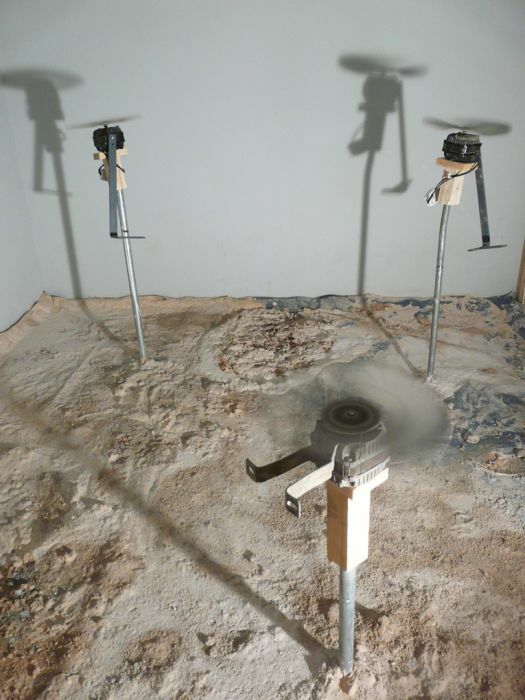 Platform with Burner, residency show at Florence Trust, permanent installation, Adam Watts, 2011. Building Support, Photograph, Adam Watts, 2011. Model of an imaginary abandoned building, Florence Trust Residency, London, Adam Watts, 2011. The Two Beacons in construction for Empty Sets at Waterside Contemporary, London, Adam Watts, 2010. The Two Beacons, Empty Sets, Waterside Contemporary, London, Adam Watts, 2011. Elevated Illuminated Pyramids, installation shot at Pause and Effect 2 curated by RART, Dalston Space, London, 2009. 16:20, Installation shot, Prazi Rep at Miroslav Kraljevic Galerija, Zagreb Croatia, 2009.